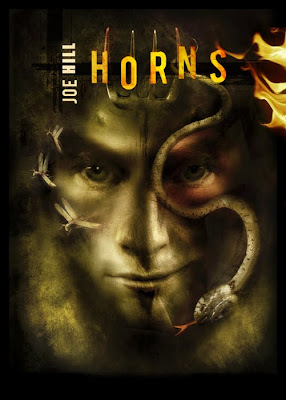 Joe Hill's second novel Horns following Heart Shaped Box is due out early next year. The above is the art for the PS Publishing limited edition done by the great Vincent Chong. The plot sounds very intriguing so I just may have to check this one out despite the fact I didn't care for Heart Shaped Box much. Ignatius Perrish spent the night drunk and doing terrible things. He woke up the next morning with one hell of a hangover, a raging headache . . . and a pair of horns growing from his temples. Once, Ig lived the life of the blessed: born into privilege, the second son of a renowned American musician, and the younger brother of a rising late-night TV star, Ig had security and wealth and a place in his community. Ig had it all, and more - he had the love of Merrin Williams, a love founded on shared daydreams, mutual daring, and unlikely midsummer magic. Then beautiful, vivacious Merrin was gone - raped and murdered, under inexplicable circumstances - with Ig the only suspect. He was never tried for the crime, but in the court of public opinion, Ig was and always would be guilty. Now Ig is possessed with a terrible new power to go with his terrible new look, and he means to use it to find the man who killed Merrin and destroyed his life. Being good and praying for the best got him nowhere. It's time for a little revenge; it's time the devil had his due. 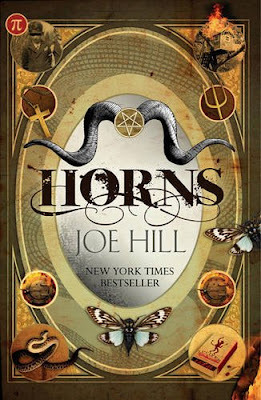 I actually liked Heart Shaped Box quite a bit so I have been looking forward to see what else Joe has to offer. The cover art looks great for both versions of the novel.